Jun 10, 2001: Have the Irish Relatives Been Found? May 14, 2001: He's not a billionaire? 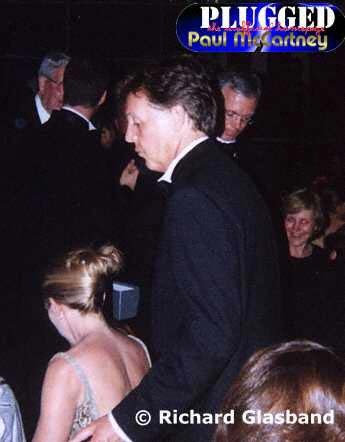 May 14, 2001: Sir Paul Is Not A "Pseud"! 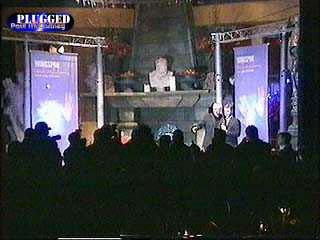 May 12, 2001: Paul to host special edition of "Top of the Pops"
May 09, 2001: Beatles For Sale? May 07, 2001: Give Ireland Back To The Irish? Educational and non-commercial use only! write it, son.' I thought, Oh, God, what? He said, 'I made it up, but I didn't write it. He meant he couldn't notate; he couldn't actually write the tune down. And, of course, that's like me. I can't write music. I just make 'em up, too." Sir Paul has entered into a charming musical collaboration with artist Peter Blake's 14-year old daughter, Rose. During a visit with her father to the McCartney farm in Rye, young Rose was humming a tune from her Chiswick Secondary School play. 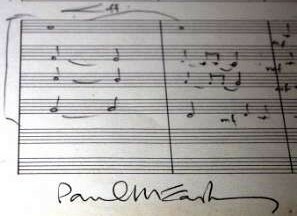 Sir Paul was so taken with the melody that he couldn't resist putting some words to it. According to a family friend, "Rose was humming the tune when Paul invited her into his studio where they composed a song in 15 minutes flat. Her teacher could hardly believe it, it's not every day you get a Beatle composing a song for the school play. But it's given Rose great encouragement, she's determined to be a singer/songwriter". Peter Blake and Sir Paul are longtime friends. Blake designed the cover for the Sergeant Pepper album, and this summer he persuaded Sir Paul to exhibit one of his paintings at the 23rd Summer Exhibition at the Royal Academy. (see May 15 below) Peter Blake is quite proud of his daughter and very touched that Sir Paul took such a kind and caring interest in her little tune. Sir Paul will join Manchester United's captain David Beckham, Sir Nigel Hawthorne, Hugh Grant, the Spice Girls, Gary Lineker and Geri Halliwell in a �14 million campaign to lure back to Britain all those tourists who have been frightened away by the foot and mouth disease outbreak. The British Tourism Authority states that many countries now see Britain as the leper of Europe which is costing the British tourism industry �200 million a week. Sir Paul will lend his assistance by joining the Uk is OK campaign as a "stars save Britain" member, granting interviews to promote Britain abroad. The television, newspaper, and magazine campaign will be launched in August and will be seen by more than 160 million people in over 100 countries. Some never before seen Astrid Kirchherr photographs of the early Beatles will be exhibited at the Mathew Street Gallery in Liverpool beginning on July 12. Ms. Kirchherr, now 63-years old, was the German photographer who befriended The Beatles during their 1960 Hamburg period and became the girlfriend of Sir Paul's predecessor on the bass, Stuart Sutcliffe. Her photographs form the definitive portrait of The Beatles' early career. The exhibit will also feature her photos of the 1964 filming of A Hard Day's Night as well as some of her shots of an early Beatles performance at the Cavern Club. Interviewed in Germany yesterday, Ms. Kirchherr stated that these pictures were her life and that she looked forward to the opportunity to reminisce about them: "I took them because I thought The Beatles were so special and I loved them." And as she was taking the photographs, did she ever imagine the band would become so famous? "Oh, no," she replied with a laugh. "The benefit of a vegetarian diet is that it gives you more energy -- that's certainly the case with me, seeing as I'm now looking at going out on tour again at an age when most people are thinking of retiring. I feel great on a vegetarian diet and I've got more drive because of it. Recently I recorded 18 songs for my new album in just two weeks.... A lot of men think that meat equals macho, but I don't agree. I agree with what Linda said -- that the most macho thing a man can be is to be kind. It's difficult for some guys to be kind, but women will tell you that kindness is the true proof of your machismo." The Los Angeles Times reports that Sir Paul has turned into a Sunset Strip troubadour. While dining alfresco with Heather Mills at Chin Chins, a Chinese restaurant on Sunset Boulevard in West Hollywood, a street musician happened to stroll by singing , "I once had a girl, or should I say she once had me . . . " at which point Sir Paul left his table to join him to provide some harmony for this impromptu Norwegian Wood performance, much to the surprise and delight of their small audience. "People can get healthier, help end cruelty to animals and do their bit for the environment by going veggie. Everyone should think about it and I hope the latest vegetarian week will help people make up their minds." For copies of the free leaflet, send your name and address to Viva!, 12 Queen Square, Brighton BN1 3FD UK, call 01273 777688 (Mon-Fri) , or see www.viva.org.uk. Beginning tomorrow at 8:00 p.m. EDT, some previously unreleased audio and video clips (including McCartney home movies) will be made available at WindowsMedia.com , MSN Music , and paulmccartney.com in high quality audio and video in Microsoft Windows Media Format. The newly edited music video of the Maybe I'm Amazed will debut on-line along with clips of Sir Paul reminiscing about his days in Wings. New content will be featured weekly. According to Dave Fester, general manager of the Windows Digital Media Division at Microsoft: "Few artists have had more of an impact on popular music than Paul McCartney, and few have been more involved in exploring music's future with digital media. Having Paul McCartney make these clips available online in Windows Media is a great demonstration of its quality and shows how the technology can be used to offer his millions of fans something special." Robin Bechtel of Capitol Records adds: "Paul has embraced the Internet since its inception. We are excited to be able to share this new and classic footage with McCartney fans throughout the world via the Internet on WindowsMedia.com and MSN Music." 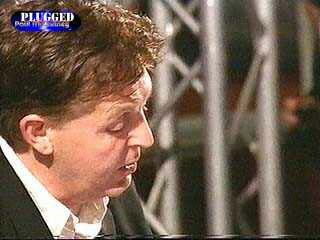 Paul at the Adopt-A-Minefield gala in Los Angeles, 14th June 2001. Last evening at the first annual Adopt-A-Minefield black-tie gala held at the Regent Beverly Wilshire hotel in Los Angeles, Sir Paul performed Drive in the Rain, a new song which will appear on his new album due to be released in September. This new up-beat song is said to have been inspired by a drive in the rain down the California cost in a rented Corvette last spring when he was in L.A. last spring working on the album. Sir Paul's performance followed a mini-set by his long-time friend, Paul Simon. Wearing his trademark baseball cap and a white suit, Simon sang his classic hits Bridge Over Troubled Water, Graceland, The Boy in the Bubble and Mrs. Robinson accompanied by a seven-piece band. At the end of the Paul Simon set, emcee Jay Leno inquired, "Is the lad from Liverpool here yet?" at which point Sir Paul removed his tuxedo jacket, and ran on to the stage to perform Yesterday, The Long and Winding Road (accompanied by a four-piece band), and his new rocking tune Drive in the Rain. The band then provided Sir Paul with what he joked was some "very '60s, very beatnik stuff." - the musical background for his brief poetry reading . The audience was deeply moved by his reading of his tribute poem to John Lennon, Jerk of All Jerks, after which he sang, Let It Be. Paul Simon then joined him on stage for a rollicking rendition of I've Just Seen a Face. One guest reported that during this duet, "It was so quiet you could hear a pin drop. Even the stars were holding up their mobile phones to let friends listen in." The event was a tremendous success raising close to $500,000 for Adopt-a-Minefield, part of the international campaign to eliminate land mines. Landmine survivor and activist Radosav "Zika" Zivkovic, who lost his leg to a landmine in a rescue effort so save a fellow soldier, was presented with the first Adopt-a-Minefield Humanitarian Award. "My take on this is just very simple. I'm basically asking the people who are going to read your newspapers and who are watching the telecast to understand that land mines are a cowardly weapon. They leave the war behind when the soldiers go home and the people they destroy or the lives of the people they destroy are the civilians. Every 22 minutes, someone becomes a victim of one of the millions of mines around the world. A third of them are children. It's time we did something about it." "I had met the producer once before but had never met the musicians, I had the greatest time with these guys. We recorded 18 songs in two weeks. I did something I used to do in The Beatles, when John and I realized we were the only ones who knew what we were going to record when we came in on Monday. I pulled a song out of my hat, and we recorded it. Later that afternoon, if we were happy with it, we'd do another one. There's a special thrill to working like that. There's no time to sit and worry and deliberate. It's fresh and challenging. These guys often didn't know what we were going to do, but when you've got good players, it's exciting work." After an introduction from former Beach Boy, Brian Wilson, Sir Paul joined Paul Simon on stage this evening at the Los Angeles Greek Theater for a rendition of the Beatles' classic I've Just Seen a Face. "I can't read or write music. I actually dreamt the music of Yesterday in my sleep. I keep a piano right by my bed (doesn't everybody?) and as soon as I woke, I played out the tune. It had many titles originally, including some silly ones. The title Yesterday turned out to be perfect . . .
"My favorite all-time singer is Nat King Cole. My favorite all-time song is the pop classic The Very Thought of You. These days I like some of the work of Eminem." A transcript of the "Larry King Live" broadcast has been posted on CNN.com. Sixties recording artist, Lulu hopes to return to the top of the charts with a little help from her friends. This fall, she plans to relaunch her career with the release a duets album with artists such as Diana Ross, Gladys Knight, Samantha Mumba, Westlife, and Paul McCartney. The McCartney track features a new song called Inside Thing, during which we will enjoy portions of the Wings classic Let 'Em In performed Fireman/Sound Collage/dance style. The wooden stage at St. Peter's Church hall in Woolton, Liverpool where on July 6, 1957 Paul McCartney first met and made music with John Lennon has been earmarked for demolition to make way for a new lobby and storage area for the church. Although the church authorities concede that the stage has "local historical and cultural significance" they feel that it has no architectural merit and does not contribute to the original character of the building. Liverpool authorities, in an effort to hold on to this important piece of their cultural heritage, have offered to remove the stage and store it until its future can be decided. The church, however, may want to sell it to the highest bidder. According to the vicar of St. Peter's Church, Canon John Roberts, the stage is "dangerous, full of splinters, and totally inappropriate for the needs of the more than 450 people who use it on a regular basis." Furthermore, he adds: "We might discover that there is quite a lot of money attached to this which would enable us to complete the work to a higher standard than is possible with current funds, when I see what they sold John Lennon's guitar for, and the original church fete program went at Sotheby's for thousands of pounds." Others, such as Liverpool Beatles tour guide Paula Copella, hope the stage will remain in Liverpool: : "It would be great to see the stage preserved and put on display where people can enjoy it. It would be such a shame to look back on this in a few years and realize we wasted an opportunity to keep our heritage, which is exactly what happened when some bright spark decided it would be a good idea to flatten the Cavern Club." Also for sale in Woolton, Liverpool is Mendips, at 251 Menlove Avenue where John Lennon lived with his aunt Mimi after his parents separated in 1945. Although an oval plaque, unveiled on the 20th anniversary of John's death, hangs above the porch of the home where John, Paul and George used to meet to make music, the National Trust, which now owns Paul McCartney's family home, has no plans to buy the property. The National Trust has stated that they purchased the McCartney home because: "It is the place where Love Me Do and I Saw Her Standing There were written, and there are fantastic photographs of the group performing there. We have no intention to buy any of the other former homes of the Beatles, since they do not have the same significance." Thus, the present owner plans to offer John Lennon's home for sale over the Internet. 38 years after the Beatles' final Cavern Club performance, Paul McCartney returned to the famous stage in December 1999. The accompanying internet broadcast set a new record in attendance figures. Everyone was desperately waiting and hoping for a release on video. People were writing to Paul's office, begging for a commercial release. The webmaster of this site has also been receiving numerous questions about a pending release. 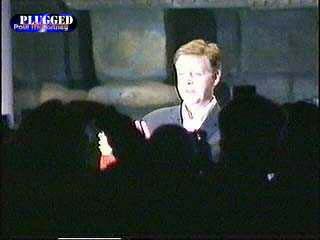 Finally, the Cavern Club performance becomes available. The DVD is particularly attractive since it not only adds a digital 5.1 surround mix in both Dolby AC3 and DTS, but there are also the two music videos from the Run Devil Run album which are virtually unseen. 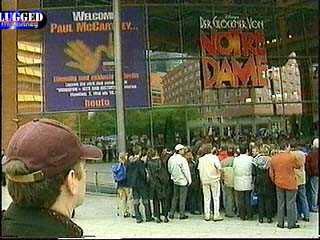 Hundreds of fans waited in line overnight in Rockefeller Center for an opportunity to meet Sir Paul at his first ever American book signing. 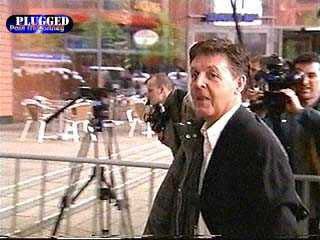 (See June 6 below) Sir Paul said: "The event was just a little way of saying thank you to the American people." According to People magazine, the fans had some interesting questions to pose to the poet: Will you attend my wedding? Do you still have the necklace I gave you at the 1976 Wings concert in Madison Square Garden? Do you know I love you? 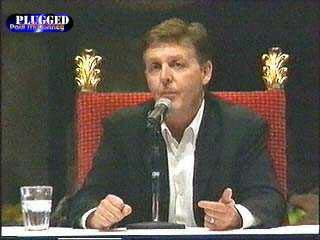 Sir Paul had a few questions of his own. He asked a hip-hop clad boy, "You like my stuff?" and an older man", "Was it hard to take off work?" The signing lasted and hour and a half (the longest signing yet) during which nearly 200 books were autographed. Before leaving, Sir Paul answered one final question - What artistic worlds are left for you to conquer? "Many, many," replied Sir Paul. "Photography, sailing, nuclear science. I could do it!" BTW, for those who have never experienced this pleasure, one lucky recipient of a Paul McCartney handshake at the book signing reported, "His hands are as soft as silk." Sir Paul is helping a talented child's dream come true. Fourteen-year-old violinist, Micha Lindan, came to Britain to escape the aftermath of radiation in Chernobyl, Ukraine. Thanks to a generous donation from Sir Paul, the boy will be able to develop his amazing talent at the world-renowned Chethams School of Music in Manchester, England. In commoration of the 36th anniversary of the writing of Yesterday, Sir George Martin has arranged for a series of 500 valuable Beatles' lithographs of the original score of the song to be sold at auction to raise money for the island of Montserrat, the British colony which was devastated by a volcano in 1997. Sir Paul has autographed the first picture in the series with the words, "Congratulations you're Number 1". George Martin has promised to deliver it in person to the top bidder anywhere in the world. Sir George thanked his old friend saying: "I'm very grateful to Paul McCartney for helping me produce these wonderful lithographs and hope they will excite a feverish bidding frenzy." Sir Paul added: "When the tune of Yesterday came to me in my sleep, I never imagined that the song that I had dreamt up would cause such interest so many years later. But I'm proud that it has because - like George I love the island of Montserrat and its people. I'll be delighted if this song can help their future." Sir George went on to explain: " This is not a charity that is helping depressed people. They are determined to make it work and we are going to help them ... It was wonderful to work there. I took Paul, Linda and the kids, and Stevie Wonder came. Nobody took any notice of Paul!'' It was Stevie Wonder who caused a sensation among the islanders. The lithographs and other Beatles memorabilia will go on display in the HMV flagship store on Oxford Street, London on Thursday, June 14. The first lithograph and a portion of the limited editions will be auctioned beginning June 14 on Yahoo Auctions' online. You may also wish to visit the Yahoo auction site to view a 5-minute video of Sir Paul signing the first lithographs, including several clips of Sir Paul singing (and whistling) Yesterday. Also appearing in the video are Sir George Martin and David Linley who designed the frames (for free, Sir Paul notes in the video). Viscount Linley is the son of Britain's Princess Margaret and the nephew of Queen Elizabeth. The site also presents George Martin's designs for the new cultural and community center for Montserrat which will benefit from the funds raised in this auction. June 10: Have the Irish Relatives Been Found? "We haven't really looked very far into our family history. I had some idea when I got this book that Paul McCartney's brother Mike had brought out 20 years ago called Thank You Very Much. It told about an Owen Mohan who left Tullynamalroe, County Monaghan, when he was about 12 or 13 and went to England to work for a coal merchant. I had an uncle Owen who did that but we were not able to find him when we were trying to invite him to a wedding in the 60s - before Paul McCartney would have even been famous. They said Owen had moved to Scotland and we weren't able to find him so I don't know what became of him. He was the oldest brother when my father would have been the youngest." (Although Peter Mohan suspected he was related to the famous Beatle, he never pursued it.) "I just thought to myself: 'Sure he'd be too rich to bother with the likes of me'. Owen Mohan from Tullynamalroe in Monaghan would be Paul McCartney's grandfather. And Owen would be my uncle. It looks like it's the right connection all right." Peter's wife Olive added: "There might be others who are related, but sure I'd talk to him if he called at the door. I'd put the kettle on for him." Even though Les Paul, revered as one of America's great guitarists and recording innovators, turns 86 today, he continues to play with his trio every Monday night at New York City's Iridium jazz club. Paul McCartney has recognized the Les Paul influence on his style, saying in an interview that he and John Lennon used to open their early gigs at various Liverpool clubs with a rendition of Les Paul's How High the Moon: "That would get the crowd's attention right away. Everybody was trying to be a Les Paul clone in those days." According to Heather Mills, Sir Paul will perform "some of his new stuff probably" at the June 14 Adopt-a-Minefield benefit to be held at the Los Angeles Regent Beverly Wilshire Hotel. Paul Simon will be on stage that evening as well, along with host, Jay Leno. Still denying the wedding rumors, Ms. Mills told USA Today: "There are no plans, and that is the truth -- none that I know about." And has she met Stella and the other McCartney children? " 'Course I met her. We're all great friends and get on brilliantly well. They're a very talented family. It's all in the genes." PAUL McCARTNEY has agreed to host his first-ever USA in-store signing session - in the centre of New York at lunchtime on Monday, June 11th. Paul will appear at Barnes & Noble's store at Rockerfeller Centre (600 5th Avenue), where he will personally sign copies of his new book of poetry and lyrics, Blackbird Singing. The event will mark the first time in his career that Paul McCartney has ever staged an instore- signing session anywhere in America. Organisers are working hard to ensure crowd control at the event, which comes at the request of Paul's publishers, W.W. Norton & Co. Paul McCartney will conduct his 'Blackbird Signing' at the Barnes & Noble store from 12.30 pm. Blackbird Singing is Paul McCartney's first anthology of poetry and lyrics. The book, published by Norton in April, has sold more than 55,000 copies in the UK and USA. It is now being translated into Japanese, French, Italian, German and Spanish. Paul has given three readings from Blackbird Singing; in Liverpool in March, at New York's 92nd Street in April and last month at the Hay Literary Festival in Wales. Just one month after its release, Wingspan has been certified double Platinum by the Recording Industry Association of America! Entering the Billboard chart at No. 2, the album is the fastest-selling McCartney release of the post-Beatles era. According to Billboard magazine, "Wingspan ranges far and wide across McCartney's genius for lyrical melody ('Maybe I'm Amazed,' the inexplicably touching 'Let 'Em In'), pure rock 'n' roll insouciance ('Junior's Farm,' the hip, Lennon-esque 'Let Me Roll It'), and epic theatricality ('Band on the Run,' 'Live and Let Die')." Wingspan is now the subject of a new series of officially authorized full-color hard-copy (not virtual) postcards, which can be selected on-line and sent worldwide. One may select three free postcards, after which there is a nominal charge. These postcards may be accessed at www.paulmccartney.com or via the Wingspan link at www.hollywoodandvine.com. "She's a very brave girl. She will go into earthquake scenes and minefields because she cares very much about it. She's very brave and very courageous, so I admire her - but I worry when she goes to these dangerous places. But we have great discussions about it." 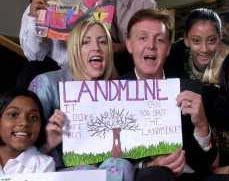 As Adopt-A-Minefield UK patrons, Sir Paul and Heather Mills have paid to have a 16,000 square meter area in the village of Paulin Dvor, East Croatia cleared of land mines. They have also contributed to similar programs in Afghanistan, Bosnia, Cambodia and Mozambique. "I think because she (Princess Diana) was the very last high-profile person who got involved, the moment she died so tragically the issue fell asleep. There was no one who could follow her. Heather was involved before Princess Diana got involved. I think if something needs to be reawoken you can't let issues like this go to sleep because you haven't got a high-profile celebrity." "I just started to realize that war was one thing - if a country is attacked then it will want to defend itself. But when the war is over, the pity is that it gets left behind with land mines. I think that isn't brave. I think even the bravest of soldiers wouldn't want that. Our role is to try to persuade governments that leaving the war behind is a cowardly idea. At the moment it's up to us at Adopt-A-Minefield to do that clearance and I don't think it should be." "I would like to say to Bush 'get with the program and let's ban land mines'." "It's for a great cause and everything I can do to help, I will." Today, Sir Paul and Heather Mills hosted an Adopt-A-Minefield UK event at the British Academy of Film and Television Arts headquarters in central London. Among the 160 guests at the reception were the young winners of a nationwide poster competition in which children were asked to design posters depicting the devastation causes by land mines. "Imagine living in a country during a terrible war and then peace is declared. You think the killing is over, but when you take your kids to the beach you can't walk on it because the beach blows up if you do. This is the legacy of the land mine. Land mines take or wreck three lives an hour, every hour of every day of every year. We have to come together now to try to stop that." During his visit to Ireland last week, Sir Paul paid a visit to his mother's birthplace in Glaslough, County Monaghan. He had hoped some of her relatives might still living in the village. This was Sir Paul's first visit to Ireland and his first effort to search for members of the Mohan clan. Before leaving for Ireland, he had told a friend, "I really want to trace my mother's family and I long to discover my roots. I don't know why it has taken me so long and I plan to go back soon." "My mother ,Mary Mohan, was a lovely Irish lady from Co. Monaghan. She left Ireland and came to England in her teens, where she trained to be a midwife and health visitor. My dad also came from Ireland and I've always wanted to visit, but for my sins, I've never got round to it." "We had a lovely time. Ireland is one of the most beautiful countries on earth and certainly one of the friendliest. I don't know why it took me so long to discover my roots. But I certainly won't leave it so long until I return." While in County Monaghan, Sir Paul and Heather Mills spent two nights in the Red Room of Castle Leslie, and enjoyed boating on the lake, chatting with the local children, and strolling through the beautiful forest surrounding the castle, accompanied by Maxie and Cloudie, the hotel's Labrador Retrievers. Fellow guests at the castle claimed that they didn't recognize him, although one businessman did comment to a member of the hotel staff that, "'One of your guests was a dead ringer for Paul McCartney". Britain's Sunday Express reports the disappointing news that EMI has ruled out releasing "Carnival of Light", a Beatles track that they have had locked away in their vaults for the last 30 years. Sir Paul, however, is planning on using the music in the soundtrack for one of his projects, an avant garde art film about the Beatles. Nestled quietly in a corner of this year's Royal Academy Summer Exhibition hangs entry No 62 , Chocolate Sunset by Sir Paul McCartney: Not for sale. 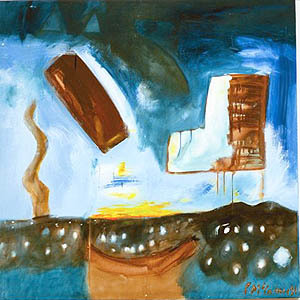 An abstract oil painting signed and dated 1991. Never before seen in public, "'this is a rather surreal picture, like some of his songs," says exhibition curator British pop artist Peter Blake (best known for his design of the cover of the Sgt Pepper album). Mr. Blake went on to praise Sir Paul's work stating, "He's got tremendous integrity as an artist. He is extremely serious about his work, about his painting, and I have hung it out of respect for him as a painter." Paul McCartney, Ronnie Wood, Holly Johnson and the late Ian Dury all have work displayed in the show. "I feel these musicians are serious painters," says Peter Blake. "It is not a publicity stunt; they are here as painters." The exhibition opens to the public on June 5 and will run through August 13. (see entry for May 15 below). And I said, 'Wye, Wye, Wye!'" After an introduction by his poet friend and editor, Adrian Mitchell, Sir Paul gave a wink to Heather Mills as he bounded on to the stage. Before turning the stage over to Sir Paul, however, Adrian Mitchell announced, "There's a girl here who's hitch-hiked all the way from Russia to see you." Immediately, Sir Paul spotted her in the audience, invited her to join him on the stage and embraced the 20-year-old student, Eugenie Evenko, while the crowd cheered. "I forgot everything. My Russian, my English. I couldn't speak. Before I came here, I hardly could dream even of seeing him. My mother thinks I am visiting friends near Moscow. I said I would be away for 20 days. When she finds out where I am, she's going to kill me." Sir Paul then proceeded to spend the next 27 minutes reading 17 poems and lyrics from his poetry book, Blackbird Singing. He also introduced a new poem entitled State of Grace. On stage, Sir Paul appeared relaxed, funny, self-deprecating, and almost surprised at the enhusiatic response his readings received from the crowd. "You are a great audience," he told them as every stanza he read was met with a roar of approval. "When I met John Lennon, I wasn't impressed with him, He smelt of beer [and Sir Paul thought] oh, you're just a bit vulgar." "I used to take one out of every flower bed, no one would ever notice . . . But then I got a letter from two ladies. Dear Sir Paul, We have seen you, and if you don't stop we're going to report you . .."
At the end of the reading, the 1,300 member audience rose to their feet in a standing ovation before Sir Paul entertained their questions. He told the audience that he "enjoyed" reading his poetry although it was "very different to singing songs". And the critics? "The critics thought I shouldn't be allowed to do this kind of thing; I always get them, I don't know what it is about me." He hinted that his next project may involve photography after having taken some "good photographs" during a recent holiday in India. Finally, as Sir Paul was given his white rose to mark the end of the event, the audience rose to give him a second standing ovation. "The great thing is, it vindicates Linda. I know she wanted to do the Wingspan thing. She knew that if it was laid out correctly, people would get the idea. With all the slagging off she got, like the famous Knebworth tape... The truth is she was doing this (he stands and raises his hands above his head to clap) She was the big cheerleader. But you don't see the visual. You just hear this out-of-tune- voice, and I know she always wanted the record put straight. And this does. You see her playing. And you hear her singing beautifully." "Everyone thought John was the hard, working-class hero. As you know, if you look at his house, he was actually the middle-class one from Woolton. We were the scruffs. He had the full works of Winston Churchill. Nobody any of us knew had that. A set of encyclopedia was the most anyone in our class had. But he had the works of Winston Churchill and he'd read 'em I think." "It's one of the great blessings of my life, seeing as he got shot, that during the last year we made it up. It was cool that I'd started ringing him. We'd had a bread strike over here and I rang him and I was saying, What are you doing? He says. I'm baking some bread.' 'Oh! Me too.' Imagine, with the stereotypes, John and Paul talking about baking bread. "He'd just had Sean, and he was talking about just padding round the apartment in his dressing gown, putting the cat out and changing the baby. It was really warm to be able to talk to him that ordinarily, finally. It was like we'd got back to where we been when we were kids." Tomorrow evening, The Sunday Times Style & the Costume Society annual lecture will be delivered by Stella McCartney at the BP Lecture Theater at the British Museum, London. During the hour and a half "Evening with Stella McCartney, she will talk about her life and work, and answer questions from the 320 audience members. "You don't have to be one or the other, do you? I'd go to the country more and more if I could. Even when I'm in New York, I try to make time to slip off to my dad's place on Long Island for a break. And I love riding. I take after my mum, although I'm not quite so obsessive: she used to ride every day." "I come from a very close family. I have two sisters and a brother, and we all come home as much as we can. We kids see a lot of each other. It's the way we were brought up. My parents were the sort who'd say, 'Let's all go to Scotland and live in a shed.' And we'd do it." "I've become a media person. Wherever I go there are cameras. Then I think of all the young designers who'd kill to be in my position, and I can imagine them saying, 'What the hell is she doing it for if she doesn't like it?' And I think, get a grip, it's your bloody job." mum. That's how I want to be. I've inherited her love of cooking, and I very much want to be married and have children one day. I'd rather not do fashion if it meant that I couldn't have time for a family. But I don't think women today need to make that choice. Look at Donna Karan. She's a designer, a businesswoman and a mother. It's that sort of woman, who can do several things and keep a balance in her life, that I want to dress." I decided to go with their offer because I felt they were the sort of people I'd like to have dinner with, and I admire the way Tom makes design-led decisions. "The philosophy of the Gucci Group appealed to me. It is not only that it is a very clever, imaginative company, it's also that I think Tom and Domenico understand me. After all, they chose me -and that's a tremendous compliment. When I was trying to make the decision, it was flattering that so many of the big guys were interested in me, but at the same time it really stressed me out. I thought hard about setting up my own label, but I realized that after all my questioning and worry -I was even having panic attacks -what I most admired was people who were independent. So I thought, that's me." keep such a gross taste going is, 'Hello? Do you think it's modern to drape a woman in the fur of a dead animal?' You know what? I can think of a hundred better ways than that for a woman to show that she's rich." Last weekend, Stella announced that she will star in an anti-leather film that is being shot by Respect for Animals in London. The film will be shown in cinemas across Europe and America in October and is expected to shock audiences with its brutal depiction of animals being killed for their skins. Appearing in the minute-long film with Stella will be some of her celebrity friends, including actors Jude Law and Sadie Frost, and singers Geri Halliwell and George Michael. As noted earlier (see May 23 below) Sir Paul flew to Ireland last week to attend a dinner marking the opening of artist Francis Bacon's 7 Reece Mews studio which has been moved brick by brick from South Kensington, London and reconstructed in the Hugh Lane Gallery in Dublin. Three years ago, Sir Paul's close friend, John Edwards, donated the studio the to Dublin which was Bacon's native city. The studio served as the artist's home and legendary working space for the last thirty years of his life (he died in 1992) and it was here that he produced some of his best work. Sir Paul knew Francis Bacon, who is considered to be one of finest figurative artists ever and one of the greatest European painters of the twentieth century. 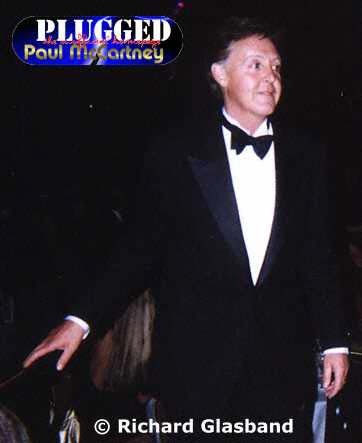 Dinner guests reported that Sir Paul was "in fantastic form" at the function that evening: "There was a traditional Irish band and Sir Paul got up and did an Irish jig with the gallery director." While in Dublin, Sir Paul and Heather stayed in the pounds 1,500-a-night presidential suite of the brand new Four Seasons Hotel. According to the hotel staff: "We didn't see much of them because they spent a lot of time in their suite but whenever they came out they were hand in hand and seemed besotted with each other. They are a lovely couple. They would talk to members of staff and were always very polite. They may be famous but they had no airs and graces." On November 30 , Sir Paul will join world figures, diplomats and celebrities in an international Night of a Thousand Dinners event in support of the anti-land mine campaign. Although the event is still in the early stages of organization, it has already gathered widespread support as more than 500 individuals in over 70 cities around the world have offered to host receptions or dinners in their private homes or elsewhere in hopes of raising at least $1 million to rid the world of land mines. Sir Paul is lending his support to the project being organized to take place in London that evening. Since March reports have been circulating that Sir Paul has agreed to headline dairy farmer Michael Eavis's Farm Aid event being planned to assist Britain's crisis-hit farmers. Now plans have reached a stage where a date has been set and a venue is being sought. The Millennium Stadium in Cardiff, the Milton Keynes Bowl, and Knebworth are all being considered as possible locations for the September 8 event. "Playing in a band totally stopped me >from being a working photographer, my career just stopped. Before that I was taking pictures for all sorts of magazines and was working on photographs for a book about rock and roll. But it stopped because I joined a band and all the time that I was in that band was time that I would have been taking photographs. Photography was more important to me than music - but my husband and my family were more important to me than photography, and I was prepared to give up photography for them." "Because of her perception, Linda could see the way you are inside, beyond the act or the image, and it was that honest reality that she photographed. Linda had an eye for honesty, she saw the truth and that shines through all of the images that she produced. Her pictures are all very natural, nothing was posed". "I'm hoping for a great night. It's great to be back in Dublin." "Paul really wanted to see how George was and thought it was an ideal opportunity to get together because they were both in Italy at the same time. It was quite a moving meeting for both of them. Paul really cheered him up." Sir Paul bragged that he is incredibly proud of his daughter Stella and of her success as a fashion designer - even though none of her stuff fits him. He noted that he sees a lot of Linda in Stella, especially in her campaign against the fur trade. Stella even warned Madonna that she had better not wear fur or else, something Sir Paul claimed he'd be too frightened to do. He has also been in contact with George Harrison who is in Italy recovering from his recent surgery. Sir Paul reports that George is in good spirits, sounds very positive, and is making a full recovery. Sir Paul stays in touch with both George and Ringo during the year and always sends Christmas cards to their families. He also spoke of the making of the Wingspan album. Although he missed having Linda there adding her thoughts and ideas, her influence was still strong, thinking: "Yeah, Linda would like that song on there." "It was great fun, 'cause I never usually get to spend two hours talking to one of my daughters, let alone having her boss me around and me joking with her on camera." Jono Coleman reports that Sir Paul looks healthy, happy, supremely confident, full of humor and glowing with love. "You can't re-form Wings for the same reason that you can't re-form The Beatles, because a very important member of each band wouldn't be there. With The Beatles it is John, and with Wings it is Linda. "I know we got criticized during Wings for me having my wife in the group, but the Wingspan album will explain for the first time just why she was in there. The film totally validates and vindicates Linda." Premiering Sunday, May 20 at 9:00 P.M. (ET/PT), VH1's Legends: Jimi Hendrix will feature an interview with Paul McCartney. follow up to the multi-platinum Beatles 1 CD." would be fun to do it with them. So I'd like to get out there around September." "We didn't book any gigs, we just showed up at British universities and knocked on the door, asking if we could play the students union hall the next day. It was all a bit gypsy, we literally just winged it - we just got in a van and headed north up the motorway looking for work. But it was great fun and it was very fresh - I liked the freedom of doing it like that. On Wednesday, May 30 at 2:30 in the afternoon, Sir Paul is scheduled to read his poetry at the Hay Festival of Literature and the Arts 2001 in the market town of Hay-on-Wye,in the Black Mountains of Wales. "They are musicians who take painting very seriously. When I had my show at the National Gallery, Ronnie Wood came along, and I've looked at Paul's work for 20 years, even though he's been very hesitant to show it until recently." The Royal Academy's Summer Exhibition opens on Tuesday, June 5 and will run through Monday, August 13. "John and I were 20 when we signed our first agreement in a dark flat in Liverpool which still applies to this day. And many bosses later - most recently Michael Jackson and Sony - we still haven't had a raise. Luckily I've done so well I don't feel bitter, but it's pretty terrible and wrong. They should recognize our success and alter the deal. At one point Yoko earned more from Yesterday than I did. It doesn't compute, especially when it's the only song that none of the Beatles had anything to do with. I asked as a favor if I could have my name before John's on the Anthology credits for Yesterday, and Yoko refused." 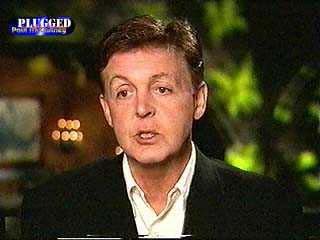 However, Sir Paul said life was too short to keep pursuing the matter with her. May 14: He's not a billionaire? "It's not true. I don't even know how much I'm worth, and I'm not sure my accountants know either. But I'm very well off, which is great because as a working-class lad from Liverpool, that was my intention." May 14: Sir Paul Is Not A "Pseud"! "My God, bastards. Private Eye isn't supposed to turn on me. I'm their friend. That's the last donation I give them ... (it's) the last place I expected to be. I'll defend the poem over anything." "Critics will be sniffy whatever I do - I can almost hear them sharpening their pencils." In a Radio Times article, Sir Paul has accused the British press of lowering the standards of journalism, particularly in the articles they have written about his relationship with Heather Mills. He described the British press as "the naughtiest in the world". "I've still go the disc somewhere but it kills you if you handle it, or even look at it. Maybe Superman can touch it but someone told me that rhodium is poisonous and that's why I don't go near it." Rhodium is a costly metal, 10 times more precious then platinum. Experts claim it is perfectly safe and used in the creation of some of the world's most expensive watches and jewelry. Wingspan entered the U.K. album top ten at position 5 today. May 12: Paul to host special edition of "Top of the Pops"
Paul will host a special edition of Top of the Pops 2, to be shown on BBC2 on Wednesday May 23rd at 18.00 GMT, repeated on Saturday May 26th, time tbc. Paul will be introducing & talking about 10 songs: Hi Hi Hi, C Moon, My Love, Maybe I'm Amazed, Band On The Run, Live & Let Die, Silly Love Songs, Mull of Kintyre, With A Little Luck & Coming Up. 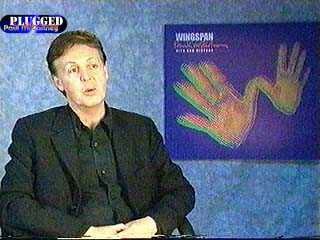 On Monday, May 14 at 8:00 pm VH1 premiers a one-hour special called The Best of Paul McCartney And Wings: Wingspan. The special features such rarities as seldom seen performance videos of the band, some Wings footage from the McCartney personal collection, his own home video of Wings in the studio, and an exclusive interview with Sir Paul himself by VH1's Rebecca Rankin. BBC Online is allowing you the opportunity to listen to Sir Paul's BBC Radio 5 interview with Simon Mayo. Sir Paul appeared as the first major guest on Simon Mayo's new Five Live radio program. "I don't often get excited about interviews, but right away I phoned my mom and said I couldn't believe how excited I was. And she said 'I guess so, he's a f***in' Beatle!' I tell, ya, she's like a dock worker." The interview will air in two parts on May 12 and 19. "Probably about five years ago. I was popping some snapshots into a family album. I said to Linda, 'When are we intending to sit down and look at them all?' We also had a lot of home movies and videos, and we realized that people accumulate all this stuff and hardly ever look at it. We decided we'd use our next wedding anniversary to do that, and we did. It was really cool. "Also, she'd had our son-in-law, Alistair Donald - Mary's husband - make a tape of the home movies. Instead of doing a rough assembly, he got into it, with music and editing. He took us through the story of each of the kids, and we thought, 'That would have made a fantastic TV hour.' That's where the idea for 'Wingspan' came from, since we asked Alistair to put together something about Wings as well as our family. He's been working on it for years, and he's done a fine job." "That's the longest I think I've ever talked to her in our lives. Who ever gets two days flat-out with one of the kids? She was excellent. I told her she could build an entire series out of it, but she doesn't want that. She's a mom first and foremost, so she doesn't have the time. The other great thing was that Alistair looked after our interests and saw this was the kind of show we'd want made. It was a family affair. "It's great [in helping] people to appreciate Linda's role in Wings. It's really special that way. Anybody who might have wondered why I had my wife in the band-and there were people early on asking, 'Why's his old lady there?' - will totally understand it when they see the show. To see that whole period laid out is sort of a shock, but it's a good story. challenge to make it all work." "I'd meet up with George and Ringo and we would always reminisce. Then we'd see a book or an article claiming to tell it the way it was, and it didn't. We'd wonder why they wouldn't get it right; then we decided to do it ourselves before our brain cells melted. Even then, we'd disagree on some memories. We'd joke, 'Give us 10 more years, and we won't even remember who the Beatles were.'" Sir Paul launched his Wingspan documentary today in France at the Cannes Film Festival. "There is a chance I may get married again, but that is a decision we will make in private and only then will we make it public. It is quite embarrassing when people come up to me in the street and say congratulations. I can say here and now we are not engaged, but there is a good chance I will get married in the future." "Heather had a very tough childhood which has been well documented. As a result she missed a lot of the Beatles stuff, it is a generation thing, in fact she prefers Wings to the Beatles. I will go as far as to say she is a massive Wings fan. I suppose that is quite funny." "Wings was a form of therapy. I went through a rough time after the Beatles and didn't know if I wanted to carry on. I suggested to Linda that we should start a band and straight away I knew it was the right thing to do. I suppose Wings helped me through a very difficult time." "She made a tremendous difference to the band and quickly learned to play keyboards and harmonize beautifully. Michael Jackson even requested that Linda play keyboards on one of our collaborations, and Michael Jackson isn't stupid,"
"When Linda and I were together all the love songs were basically for her. That was like 30 years' worth. And then since her death, for about the first year and a half, they were still about Linda. I certainly have written things consciously about Linda since she died. For the new album there are a couple of pieces about that. But now some of them are about my new relationship with Heather Mills. It's whoever I'm feeling strongly about." "That I was having any relationship was weird because they were used to me just being with their mum for 30 years. So the idea of a new relationship was very puzzling and confusing, but I started to see someone I liked and started getting into a relationship. And then I think the big shock for them was her age - that's she's actually younger than one of them; than my daughter Heather, strangely enough. But I think they dealt with it very well, actually. I think anyone who knows these situations knows this isn't easy for anyone and that after a marriage of 30 years it was never going to be easy. But we got through the worst phase and they're very mature, my kids. If Heather and I are to have a good, permanent relationship, I know the kids will be there for us." "She's very strong. She's very determined. She had to be strong to have got over what she's got over. But she's strong in a very good way. A very positive person. "When Linda was ill it triggered memories of my mum. I tried to put it into the back of my mind because we were always hoping that Linda wouldn't die." And what about that collaboration with George Harrison? "George would have to want it. The thing is we had the opportunity during the Beatles and we never picked it up, so maybe that was something." So after the music, the painting, the poetry, what can we look forward to next? "I've always wanted to do my own full-length animated film so I'm kind of working on one at the moment. Linda and I were big Disney fans." Today Image Entertainment announced June 19 as the release date for the highly anticipated ''Paul McCartney: Live at the Cavern Club'' on DVD and Videocassette Both releases will contain footage from the December 14, 1999 concert with Sir Paul featuring songs >from his Run Devil Run album. The DVD release will include Dolby Digital 5.1 surround sound, a video interview with Sir Paul, music videos, biographies and more. The syndicated radio network, Westwood 1, will air a special about the Wings phenomenon to more than 400 American radio stations. Please consult your local listings for broadcast date and time. May 9: Beatles For Sale? Reports are circulating today that Michael Jackson is preparing to sell the rights to the songs of The Beatles back to Paul McCartney for a mere $700 million. If the reports are true, Michael would be earning a tidy profit since he only paid $50 million for the catalog back in the mid-'80s. Lennon and McCartney: the Musical Story of a Friendship That Changed the World, is a new "musical biography" portraying the musical team from their first encounter in Liverpool through Beatlemania in the '60s and beyond their breakup in 1970 is scheduled to open on Broadway next month. The show is directed by longtime Cats cast member, Marlene Danielle and features original music by Steven Schecter. There has been no indication that the project has been sanctioned by either Sir Paul or Yoko Ono. ''A lot of the Wings stuff, the early music, was in the shadow of the Beatles, but as the years went by, we knew we were making a really good group. The Beatles would be my No.1 band really, but I have a lot of emotional attachment to Wings. It's two different stories. "I saw George and Ringo a few weeks ago, and they were thrilled with the success of that [The Beatles 1]. It means that the dreaded generation gap that parents feared doesn't exist. Parents say, 'Hey, that's my music,' but the kids say, 'No, it isn't.' So it brings everyone together. "The Beatles were a group that had gone and done it magnificently, but Wings was a start-up group. Obviously we weren't going to reach the heights the Beatles had achieved in our first couple of years, but by the time [Wings] got to America in 1976, we had a really good stage act and a really strong repertoire. 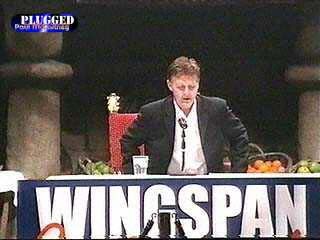 "Wings did eventually answer those critics by coming up with some really strong stuff that audiences liked. Some of the big hits are commercial, because obviously that's what you're trying to do with them - but on some of the album material, like, say, I'm Carrying, there was strength and depth there." "You look at the show and go, 'God, now I know exactly why she was in there.' Not only was she my best mate on stage, but you see her leading the crowd and you hear her harmonies. She stood up in her own right. And you see her keyboard work. People used to say, 'Oh, she's just playing with one finger.' We'd say, 'Well, that's a Moog synthesizer. It's monophonic. You can use 10 fingers if you like, but only one is going to register.' "
"It brings me out in a cold sweat just to watch it. The show has the trials and tribulations that we went through to get Wings together - and also to bring up our young family. It's got a certain drama because of that. And all the time, of course, there's this music playing in the background." "We were mugged by six African guys in the jungle. It was intense. But Linda saved the day, screaming at them. I think they thought it was their mum telling them off. She started screaming, 'Get out of here!' But they robbed us of all our stuff, and you'd better believe we were shaken up. Yet we tried to channel it into something productive. When we got into the studio, we made Band on the Run. We managed to put all that aggression into the music and turn it around." "My kids would go to school and their friends would say, 'Oh, have you heard the new Guns N' Roses song? ' My kids would say, 'Oh, my dad wrote that!' And they'd say, 'Get out of here!' Nobody believed it." "I'm very excited about it. For a few years now ... I've had some songs that I've been writing, and I thought it time to make a new album. It's all new songs. I really can't categorize it. We just made music and enjoyed it. That's the best way to do it. . . . And we didn't fuss about it. I didn't even tell the producer or any of the guys what we were going to do until the morning of the day we were going to do it. Nobody knew what I was going to pull out of the hat. I just said, 'OK, guys, what do you think of this one? Let's go to it.' So it's very fresh." And what about future collaborations? "We had a really good meeting with Colin Powell. We're not going to stop the land-mine problem overnight, but we're going to make a big dent in it." "She is just so up; she's cheeky; she just gets on with it." May 7: Give Ireland Back To The Irish? "I support the idea of Ireland being free and being handed back. I feel that, like a lot of people, but I don't support their (the IRA's) methods. I certainly don't want to be in support when a bomb goes off in London and people are killed. I would have a hard time supporting that. So when EMI rang me up and said, 'Look, you know, we're pretty nervous and you don't have much time on the album. We should pull that one,' that was really why it got pulled." For Sale: Sir Paul's 1966 Aston Martin DB6. Finished in Goodwood Green, the automobile features black Connolly hide trim and black carpets and includes such options as chrome wheels, heated rear screen, Motorola radio with powered aerial, and a pair of Britax seatbelts, all for a purchase price of pounds 4,500. It was one of only 1,328 made. The car was first registered in Brian Epstein's name. The ownership was transfered to Sir Paul after his death in 1967. The Aston Martin was sold to Mr. Nicholas Defries in September, 1972. It has been kept in a heated garage and used sparingly since. The 3,995cc, six-cylinder engine was replaced with a works-reconditioned item in the mid-Seventies, when the mileage was 58,000. In the early 1980s, the chassis box sections were replaced by an Aston Martin specialist, and the body was resprayed in its original colour. The vehicle was placed in storage in December, 1984 and has been used only for display in classic car shows since. It currently shows 79,868 miles on the odometer. Sir Pauls car will be up for auction on May 12 at Bonhams auction house. Experts say it is likely to fetch at least pounds 40,000.
to lie you between the twin beds, you have to lie down with her. So I felt like, you know, we--we should be married to do this. it became a poem. It's called "Masseuse, Masseur." your eyes, till someone comes to blow the candle out." SIR Paul still seems to be interested in working with his former Beatle mates. In a recent interview, he revealed how he has recently tried to write a new song with John Lennon. How could this be? Well, after hearing John play a tune in a dream he tried to put the song down on tape: "I was listening to John do this song and when I woke up I thought, 'I don't know that one.' I was going to write it with John. I vaguely remembered it and I tried to put down a demo. It was quite cute but it didn't really click. I dream about John quite often. It's always very nice." "George Harrison recently underwent an operation to remove a cancerous growth from one of his lungs at the Mayo Clinic in the U.S. The operation was successful and George has made an excellent recovery. He is in the best of spirits and on top form - the most relaxed and free since the attack on him in 1999. He is now enjoying a holiday in Tuscany. Although All Things Must Pass Away, George has no plans right now and is still Living In The Material World, and wishes everyone all the very best, God Bless and not to worry." Sir Paul is scheduled to appear on a future episode of the new Canadian Satirical TV variety show, Sonic Temple. Julian Lennon has recorded a cover version of the McCartney song Blackbird as a tribute to Linda. The track will appear on the album "Two of Us, a Tribute to Linda" which will be sold to raise funds for the cancer charity, League of Women Against Cancer. "I love Liverpool. It's my hometown. You know, some people turn their back on their hometown, and I think, you know, it creeps into songs and stuff. And I think it crept into a lot of John and my early songs like Penny Lane. Strawberry Fields was a real place next door to where he lived. "I was quite solitary till I met a young man named George Harrison. We shared a bus, that's how we got to know each other." [Their first conversation?] "Well, it was about guitars. We both liked music, rock 'n' roll." "He tried to start teaching us Chaucer in the original language, and we were 16-year-old boys, and we weren't interested at all in that kind of thing." [Until he learned about part]" Well, that's what he eventually did, he--he told me about the dirty parts. And he said, 'Get a hold of a copy with the translation of "The Miller's Tale."' He said, 'It's really dirty,' and it was the dirtiest thing I'd ever read so he hooked me with that. I had the normal instincts of a 16-year-old boy in Liverpool. "I used to be the guy in class who could draw these--do these drawings that when they were folded, it just looked like a woman. But when you pulled them open, she jumped out of her clothes." "And unfortunately, the drawing was in there, so I denied it. 'No way, no, no, no, that wasn't me. It must have been Kenny Halperin. He's like that.' And it went three days, and my father was called in on the case, and he grilled me. I still denied it. And in the end, I had to break down. He broke me down. And I--I admitted it and cried. "Remember, sexuality was nothing we ever talked about at home. I didn't know what periods were for women. That had to come much later, people explained all that. I remember actually asking once how babies were made, and my dad said, 'Do you know those two dogs we saw in the street the other day?' I went, 'Yeah. Yeah?' And he said, 'Well,' he said, you know, he kind of left it there. You know, 'Oh, no way. My parents? Doing that?' So I had much more vivid imagination than they gave me credit for. So I had horror--horror visions of them running around the street doing that. So anyway, we didn't talk about it. So to get caught out was a very shameful thing." "It's called "Dinner Tickets." (Reading) "My mother always looked for dinner tickets in the breast pocket of my gray school shirt. Dried mud falls from my work boots, zig zag sculptures leave a trail as I head for the woods. She found a folded drawing of a naked woman. My father asked me about it. Chains makes easy work of young birch blocking my path. For days, I denied all knowledge of the shocking work of art, resting on a fallen log, I wiped the sweat from my brow. Admitting I had made the drawing, I wept." In an interview published in today's New York Times, Sir Paul relates the details of a poetry lesson he received from his poet friend Allen Ginsberg during a visit to the McCartney home in Sussex: "He was all for economy. He said to me: 'Never use the word "the." And also try to avoid "ing" -- don't use 'singing,' but use 'sing' instead.' "
Sir Paul did take issue with the poet when he suggested that the opening lines of his poem should be changed from "Two doors open on the 18th of June" to "Two doors open. June 18": "I said it's great, but you're making me into a New York Beat poet." Poet Paul was encouraged, however, when Allen Ginsberg told him that " 'Eleanor Rigby' is one hell of a poem." "I was sitting at the piano vamping on the E minor chord.Da da da da da -- Eleanor Rigby picks up the rice . . And in actual fact, it wasn't Eleanor Rigby, it was something else, because I got the name Eleanor Rigby later. Sometimes the real words arrive, and sometimes I have to kind of go back and fix it. "It's like Yesterday. At first it was 'Scrambled eggs/ Oh my baby how I love your legs,' which I thought, 'That's gotta be fixed. Can't go with that one.' "
"We had been arguing about stupid stuff -- money and things, things that weren't really important in our relationship but were the kind of things people argue about. " [But back on speaking terms again.] "We talked about him baking bread, him putting the cats out, him padding around the apartment in his robe and slippers, him bringing up his baby, Sean. It was really intimate and mature, good real talk between friends." "It was perhaps unlikely in my life that I would have two strong women who I felt so strongly about. Even though it's early days in my new relationship, I do feel lucky to have met someone strong and interesting and beautiful." Stephen Logan, The Sunday Times of London: "Unlike more rarefied poets, who communicate mostly with each other in obscure crannies of our culture, McCartney writes as freely (and often as beautifully) as a blackbird sings"
Mark Hertsgaard, The Los Angeles Times:"They're not bad so much as unfinished and inconsequential." "It's not as if I'm not used to it. She Loves You was called banal when it came out -- it was the first time I had ever heard the word." His poetry readings and book signings are attracting fans by the thousands. He told the story of how during his book signing in Liverpool he was greeted by a teenager wearing a Beatle-vintage button that read "I slept with Paul McCartney." "Oh, really?" he said with a big grin, "When was that?" "After Linda died, I think all of us in the family would hear noises or see things, and would say, 'That's Linda, that's Mom.' And a lot of things happened like that. And I think it's in some ways it's very comforting to think, 'She's still here.' You like to think that. And you do--I do." " The sound man hit the button and then this voice just said, 'I'm in heaven.' And it's just that kind of thing. It's the beautiful moments, inspirational moments--'You know, I don't know if that's true, but it sure is great.' So a lot of those things happened. And then at the end of the poem I mention a white squirrel, which happened to me--I was on a horse ride--I was on my own now, Linda taught me how to ride horses, and she was a great rider. And one day after she died, I saw this white squirrel in the woods. I mean, this one was looking right at me, didn't move, my mind just went, 'That's probably Linda.' Some how our spirits got into that. And you--I think it's very comforting, you know. You don't know if it's true, but it's a great thought. "So the poem's called Her Spirit:. 'Her spirit moves wind chimes, when air is still, and fills the rooms with fragrance of lily. Her eyes blue green, still seen, perfectly happy, with nothing. Her spirit sets the water pipes a humming, fat electronic force be with you sound. Her spirit talks to me through animals, beautiful creature lay with me. Bird that calls my name, insists that she is here, and nothing left to fear. Bright white squirrel, foot of tree, fixes me with innocent gaze. Her spirit talks to me." Does writing poems console him? writing a letter to yourself. by the way, do you want to hear some poetry.' She'd always say, 'Yeah.' And the--and, "I would come back from a run, with lines of poetry to tell, and having listened, she would say, 'What a mind.' She'd fold my words inside her head, and though the lines may not have been supreme, she wasn't really being kind, she meant it what she said. And I'm blessed, for she said, "What a mind." So it's going to make a fi--make a guy feel good, that kind of thing. You know, it's just like, 'Whoa!' You remember that stuff. "This one says, 'There's a lot to be said, there's nothing to be said, my love is alive, my love is dead. I hear her voice inside my head, there's a lot to be said, there's nothing to be said. There's a lot to remember, a lot to forget, my love is heart, my love is wet, as if it was the night we met. There's a lot to remember, there's a lot to forget, there's a lot to be said, there's nothing to be said'." "I just thought in a church it would be nice to get real. And instead of just saying, 'Holy Father,' accepting God's presence, I think a lot of people, including me, sometimes doubt--have doubts, you know. So I just thought it might be a good way to open the song, you know, 'Are you there?' We're in a church, 'Hello, are you there? And then the payoff comes with God then answering, 'I am here.' And he says, 'I am here in all the good things in life.' That goes through that. I like the idea of starting off with a doubt, and then pay off, you know, we've--'Yeah, I am here'." New Yorker magazine reports that during the interview following Sir Paul's poetry reading last week, host Charlie Rose addressed Paul as John! "I'm Paul, Charlie," said Sir Paul, but hastened to ease the host's embarrassment by adding that many people do approach him to ask if he is John Lennon: "I always tell them, 'Think about it.' "
"I kinda of like Stan. I liked it that (Sir) Elton (John) did it with him at that Grammys thing, because he was suspected to be homophobic, so I guess that put that down. Which is good because it is only show biz. It's good to remember that, otherwise you start thinking 'what the f***'s happening in the world, man?" " 'It's only a song dad'. It reminded you that we had all of that with rock'n'roll - Elvis isn't trying to s***anyone, he's just moving his hips. All our parents went 'oh, the state of him'. We never saw it until they said it. I think it's the same again. But if anyone takes it too seriously, it's not too cool." "You know, when you've got the candles going and you're having dinner with your bird - as I am currently - with a glass of wine, there's no finer record really." Back at home from his U.S. promotional tour, Sir Paul paid a visit to the Brooks Brothers store in London, shopping for a tuxedo. "He was a--a black friend of mine called Jimmy Scott. And he--he--he used to just say, 'Hey, what's happening, Jimmy? Say ob-la-di, ob-la-da life goes on, bra.' An African guy. And so, I just thought, 'That's a great saying. Ob-la-di, ob-la-da life goes on, bra.' And whenever I'd see him, he'd say that. "Blackbird is a--was a song originally. And it's the title of the book, Blackbird Singing. And it was, for me, I wrote it in the '60s when the civil rights movement was at its height or it's beginning. And I like to think of a blackbird singing as being a kind of symbol for a black woman." Do his inspirations announce themselves as lyrics or poems? "Yeah, I think the poems announce themselves as poems." But could he put the poems to music? "Yeah, I think I could do that. " After reading Maxwell's Silver Hammer Sir Paul was asked if his lyrics seem different to him when read as poetry? "Well, it's--it's kind of fun to read it like that, you know, especially when you get to the 'oh ho ho ho,' which works in the song, but here it has a different kind of meaning altogether." 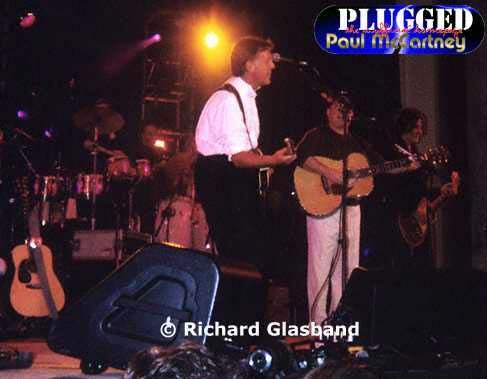 �2001 PLUGGED - the unofficial Paul McCartney Homepage, by Harald Gernhardt. All Rights Reserved.